Get the inspiration and mentorship you need to invent the future! 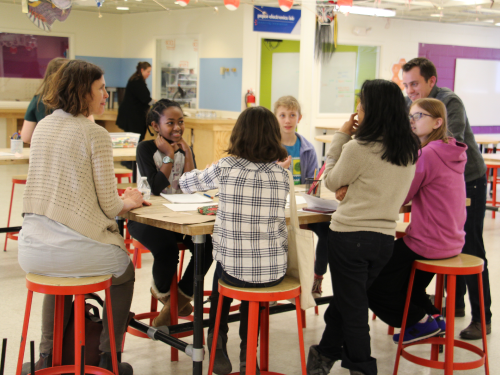 KID Museum & Bullis are hosting an Innovation Exchange for teams participating in the Invent the Future Challenge to help spark ideas and support Challenge work. The session will begin with a presentation from a local innovator, and then teams will be matched with adult mentors who will provide feedback on their ideas, assist in brainstorming, and help teams make progress on their designs. The focus is on generating and sharing ideas, and coaching teams on how to effectively communicate and collaborate to solve problems—not on providing specific technical support. Sunny Wicks is a Research Engineer at Lockheed Martin Rotary and Mission Systems, connecting research and development at Lockheed Martin to the DoD Science and Technology community. Prior to working at Lockheed Martin, Dr. Wicks received her PhD in Aeronautics and Astronautics, and her bachelor’s in Aerospace Engineering from MIT. Space is limited – register your team today! Team coordinators should register for their teams of up to 6 students. Team coordinators do NOT need to attend with their students.